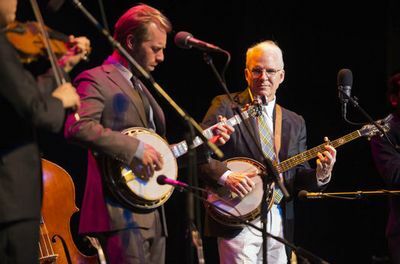 It’s hard to tell if Thursday night’s performance by Steve Martin and the Steep Canyon Rangers was a comedy show hijacked by bluegrass music or the other way around. Either way, it was a success. The 100-minute show in front of a sold-out Midland theater was a convergence of two of Martin’s passions. The banter between songs was full of the one-liners and comic sensibilities that have made Martin a movie star and inspiration to comedians since the 1970s. It also showcased the Martin’s banjo prowess, an instrument he picked up at 17. Martin was quick to mock his celebrity status. Then he checked e-mail, sent tweets and playfully berated the five-piece Rangers between songs. While many of Martin’s songs had humorous themes, it was clear music was serious business. It didn’t take long for the Rangers to prove themselves worthy musical and comedic foils. Showcasing Martin’s original material, the night opened with three instrumentals. For the bittersweet “Daddy Played Banjo,” Martin turned the mic over to Rangers’ guitarist Woody Platt’s pleasant tenor. Later, “Go Away, Stop, Turn Around, Come Back” had a nice moment when the performance dropped to just Martin and Graham Sharp on banjos before rebuilding. Knowing the evening was either an introduction to bluegrass or the first bluegrass show some had attended in a while, Martin took a few moments to explain the genre. Before the nostalgic “The Great Remember,” Martin demonstrated the difference between the Earl Scruggs style of playing — fast-paced with three fingers wearing picks — and the claw hammer style, which is slower and played sans picks. Martin gave the Rangers two solo numbers. The first song, an instrumental, featured dramatic flourishes on Mike Guggino’s mandolin. The second was a gorgeous a capella version of the gospel song “I Can’t Sit Down” that had all the Rangers singing into one mic. Not to be outdone, Martin returned and led the Rangers through his own a capella hymn, “Atheists Don’t Have no Songs.” Martin gleefully punctuated lines about atheists always having Sunday free and keeping “he” lowercase. His enthusiastically off-pitch stanzas punctured the song’s carefully constructed harmonies.